Coffinwood is just the type of place you always expect to find in one of these little rural Nevada towns but never do. Well, if you are ever driving through Pahrump, you just might stumble upon it. Coffinwood is not only one of the only places you can still purchase a wooden coffin, made to fit, but also any other item you can conjure up can be made coffin shaped. Out of Coffinwood, Bryan and Dusty Schoening run a coffin making business called Coffin It Up. Many of their clientele are Europeans who want a traditional burial. While coffins have fallen out of fashion here in the U.S. and have been replaced with caskets, across the pond, wooden coffins are still widely used. Considering the variety of different cultures on the continent, it is difficult to find a mass producer that can appeal to all of them. Coffin It Up has the advantage, as every one of their coffins is hand made and customized to every customer’s tastes and preferences. They also serve the Jewish community of Nevada. 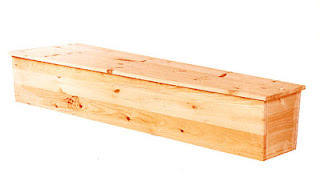 According to Halakah, a Jew should be buried in a solid pine coffin, called an “Aron” (ארון), with holes drilled on the bottom to accelerate decomposition. The necessity of the coffin being made only of wood is derived from Genesis 3:8 “Adam and his wife hid themselves. . . amongst [literally, ‘within’] the trees of the garden. "(2) Of course, there are kosher caskets available through most funeral homes, but if there is preference for a traditional coffin, Coffin It Up is the only place to get one in the entire state. One thing that is emphasized at Coffinwood is the difference between a coffin and a casket. It is not surprising that Bryan was a carpenter prior to becoming a coffin maker and has even made custom coffin shaped cabinets for a Las Vegas client. He became intrigued with the coffin shape because of the challenge it presented. Although the shape is always the same, the actual angles are always different because they change according to the overall length of the coffin. Unlike a casket, each coffin is slightly different. One tradition the Schoening's have started is to have a New Years celebration where they bury a small coffin their yard to commemorate the passing of the previous year. They, as well as any guest of the event, toss in the coffin one thing that they want to get over in the new year. This is a very ingenious alternative to the common New Years Resolution. The small tombstones in the above photo are the markers for these coffins. The Cemetery is divided into two parts. The first is a faux cemetery; no one is actually buried there. It consists of headstones made by Bryan with his favorite epitaphs (mostly humorous ones from Europe). There are also donated headstones from people who have replaced older stones of loved ones and needed a place for them. Bryan said that some locals have memorial markers here for loved ones who are buried out of state. This way they have a way of remembering them without having to travel long distances to do so. The second half is an active pet cemetery. Bryan is primarily an artist. He does in fact create more than just coffins. He is creating a cave from imitation rock behind their house and has altered one of their numerous mannequins into a wind powered scarecrow. Transforming medical skeletons into unique zombie creatures is also one of his hobbies. Dusty collects hearses also. They have restored a small fleet of them, many of which have been customized in the process. They now have a few very rare editions. The above hearse is their most recent addition. It was being used as a chicken coop in nearby Sandy Valley and has not been completely restored yet. However, it looks like it has already come a long way, considering. As you may have guessed, the grey structure with the skull and coffins painted on, is Bryan's workshop. I have noticed that the Schoening’s are frequently described as “death obsessed,” however, they insist that this is simply not the case. Dusty says it is just their lifestyle; they enjoy the eerie, morbid décor and atmosphere, but that is all. They are not devil worshipers or serial killers. The day that I visited, they had just finished their newest addition to their yard: a coffin shaped greenhouse. This is likely the first and only coffin greenhouse anywhere on Earth. Coffinwood is also home to The Church of the Coffin. That’s right, even religion can be shaped into a coffin. It is not an unreasonable idea either; their explanation is that all people can relate to the coffin as death is the great equalizer. The poor and rich, and the good and evil all die just the same, in the end. The coffin is a constant reminder of our mortality; what better memento mori than a coffin? They are a legally recognized church, so if you are looking for a unique wedding, they can certainly oblige. Their coffin-shaped gazebo is a popular choice for them. I have the good fortune of personally knowing Bryan and Dusty, as well as their lovely daughter. They are wonderful people and loving parents. They also share a love for each other that I have yet to see comparable in other couples. Although I have yet to visit Coffinwood, I hope to have the ability to soon. My sister has visited them on multiple occasions and always sends me pictures of Bryan's more recent creations. He is a very talented individual.